La Costa Dental Excellence patients who wait to have a sore tooth checked end up saying “I wish I had come sooner.” Even with all the various causes of mouth troubles, a toothache sends a simple, clear message: “See your dentist!” And it seems like toothaches always get worse on Friday night right before the weekend. If you wait, the cost to treat it may get more expensive as the pain gets more extreme. Affordable dental care is available at La Costa Dental Excellence in Carlsbad. Call La Costa Dental Excellence now for a manageable yet important consultation. Mouth pain is never “normal.” Drs. Stephen and Kimberly Dankworth will determine the cause of the pain so proper treatment can begin. 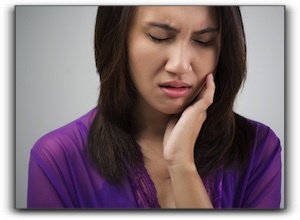 Possible causes of pain include dental caries, gum disease, a broken crown, mouth sores, bite issues, and TMD (temporomandibular disorder). Let Drs. Dankworth take care of you and you will quickly be back to pain-free eating, grimace-free speaking and better sleeping. Drs. Dankworth, DDS is also well-versed in the latest cosmetic dental procedures and is dedicated to transforming smiles. Smile makeovers at La Costa Dental Excellence boost confidence and improve a person’s overall presentation. Men and women who have invested in a smile makeover feel that their personal and professional relationships have benefited. Book a consultation if you have question about dental implants, Invisalign or veneers. La Costa Dental Excellence offers consumate care when it comes to implant supported dentures, porcelain veneers, restorative dentistry, general dentistry, and Invisalign. Don’t wait to come to La Costa Dental Excellence if a tooth demands your attention.